European stocks end mostly higher. Spain's IBEX the laggard. The European major stock indices are closing mostly higher with the exception of the Spanish IBEX. Tomorrow the ECB could start the process of unwinding QE buying. 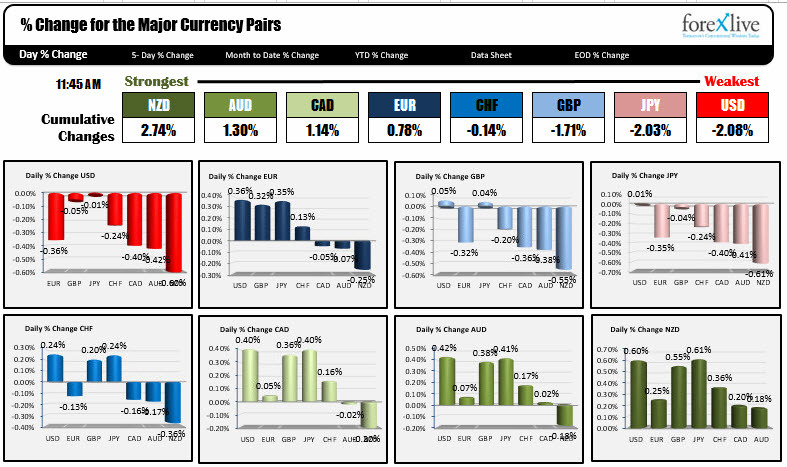 In the forex market, the snapshot of the strongest and weakest currencies is showing the USD has moved to the weakest currency of the day ahead of the US FOMC rate decision and press conference. The NZD, AUD and CAD are attracting "risk on" bids - or so it seems (it could also be some profit taking in those pairs too). US yields moved briefly higher after the better-than-expected PPI data, but has moved back in the red (albeit small declines).